The alternating pressure mattresses on sale in this section are ideal for home use. These medical air mattress heal and prevent bedsores. 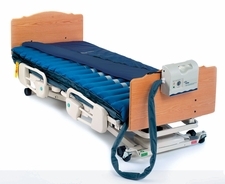 These medical mattress systems come with the air mattress, pump and cover. Additional accessories are available for these products as well. These special adjustable air mattresses are on sale and shipping is free. Alternating pressure mattresses and accessories included in this section are in stock and ship same day if ordered before 12PM EST. Limited quantities available. We offer free shipping on all of our products.